eEDM: Is 0.000000000000000000 000000000087 equal to zero? Rene Descartes felt that the central quality of matter was “extension,” the ability to occupy space. Even nowadays this is a pretty good intuitive description of ordinary matter. Most of the important objects in our material world seem to take up space. Even the things we can’t see, such as atoms and bacteria, are known to take up space. The same, however, might not be true for electrons. An important part of all atoms, electrons are generally thought to be pointlike. That is, the electron acts as if it were not an extended object. Even as a point particle, the electron’s mass, charge, and magnetic moment have all been measured to high precision. What about an electron’s electric dipole moment? Is it even there? An electric dipole moment (EDM for short) arises from a distortion in the distribution of electric charge. Some molecules like water, which consists of two hydrogen atoms and an oxygen atom, have nonzero EDMs because they have a bent, asymmetric shape. But the existence of an electron EDM has yet to be confirmed by experiment. In fact, it looks like the electron EDM is no larger than 8.7 x 10-29 e-cm. Read more to learn more on why victory hasn’t been declared. Measuring a nonzero electron EDM would likely indicate new particle physics at work--beyond what is predicted by the standard model. This is part of the motivation for experimental work in this area. Current experiments may be close to confirming or negating some theories, like supersymmetry, which predict a relatively large (still only barely measurable) eEDM. Elementary particle physics is usually performed in a city-sized laboratory like the Large Hadron Collider. 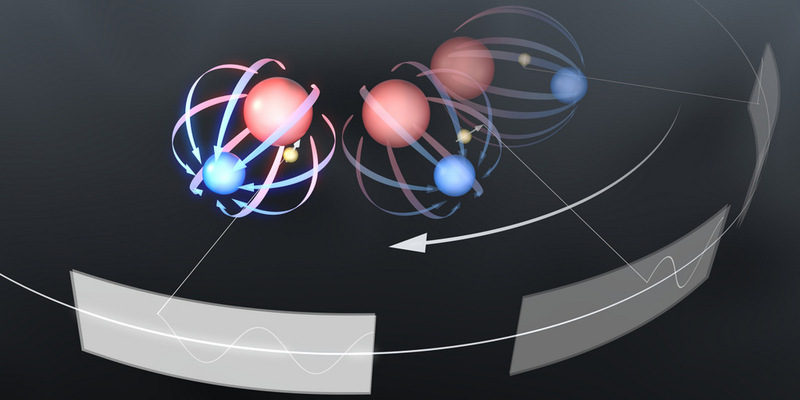 This search for the electron EDM is particle physics done in room-sized atomic physics labs. Recently two experimental groups have weighed in on this subject. One group, at JILA (a joint institution between NIST and CU) in Boulder, Colorado, looks for the roundness of electrons. Published in the 6 December issue of Science, these scientists study electrons attached to hafnium fluoride ions. These molecules, like water molecules, are polar. By immersing the molecules in rotating electric and magnetic fields, the NIST researchers hope eventually to measure electron EDM. They admit that the sensitivity of their apparatus is not sufficient to improve on previous measurements of EDM, but they expect to reach that point within a few years. The other collaboration, located at Harvard, published their results in the same journal on 19 December 2013. They observe the fluorescent behavior of thorium-oxide molecules, which have been excited into specific quantum states by lasers. The result of this work actually achieves a new upper limit for the electron’s EDM. The new bound is expressed in units of electric charge times distance: 8.7 x 10-29 e-cm. This is a factor of ten smaller than the best previous measurement.